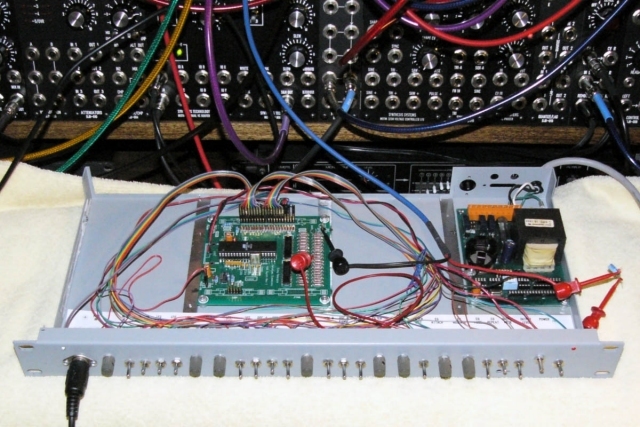 I saw information in the synth-diy music group about this synthesizer project from Elby Designs and decided it might be fun to experiment with. I did three different panel designs for a: 19" 1U rack style synthesizer, a MOTM 2U module, and a rectangular panel for a small wood cabinet to compliment my MIDI bass pedals. The FrontPanelExpress design files have since evolved so differ slightly from these images. Here is a design for a 19" 1U rack format synthesizer. Here is a design for a MOTM 2U module. I've added a MIDI thru to help with the MIDI cabling. I've raised the MIDI connectors slightly from the bottom to ensure there is adequate clearance for the bottom mounting rail. I've also changed some of the switch nomenclature to better reflect my thinking about the AVR Synth functionality. Here is a rectangular design for a panel to fit a small wood cabinet. I've since eliminated the power on LED and will use a single bi-color LED to indicate power and MIDI data. I've also changed some of the switch nomenclature and designed this in a gold with black letters to match my MIDI bass pedals. I built the synth in a spare 1U rack chassis that I had. I replaced the inboard power supply with a wall wart. I upgraded the processor to an ATMEGA32 at 16 MHz to run the updated software modifications by Daniel Krüe. Switch and control mapping changed and requires external MIDI CC controls for operation. I used a program for my CVS that merges incoming MIDI with 16 controls that send appropriate CC messages but I've since gone back to the original ATMEGA16 at 8 MHz. It works nicely and is quite stable.